This afternoon the weather was so beautiful I had to send the kids outside to play. I couldn't resist sending them out to a luscious green yard and inviting lake. (They were told to stay away from the lake though. It's not that warm.) They ran around chasing each other and rolled down a hill. (Yes, there are grass stains on Kade's pants. Thank goodness for Tide.) 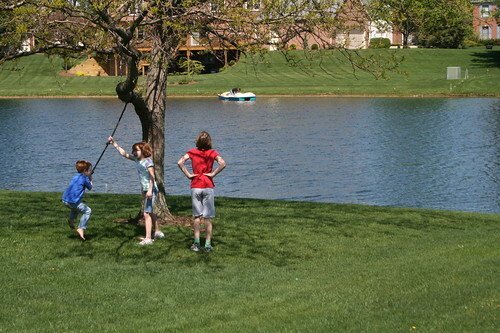 Then they wandered over to the neighbors' tree to swing. We'll have to go ask permission tomorrow. Oops. I'm sure our three weeks here will fly by for the kids if they can play outside everyday. I loved the fact that I could start dinner and watch them at the same time. I'll be able to do that in the new house too. Yay! Such a pretty picture. Too bad you won't have the lake too. It will be nice to be able to look out and see them. It's going to be great! Is Mattey telling Kaden it's her turn? I don't want the lake. Too many drowning possibilities. We can always drive down the road to visit this one though.